Keywords: non-cancer related chronic oedema; lymphoedema; pathophysiology; treatment strategies; compression therapy; resources. The aetiology of chronic oedema may be complex and a number of different factors may predispose an individual to develop swelling. Patients with chronic oedema may experience increased psychological distress and have problems with mobility. Treatment strategies should aim to control the swelling, minimise associated problems and enhance quality of life. Individuals with chronic oedema have varied needs and practitioners require specific skills and knowledge in order to prescribe appropriate and individualised treatment and care. This paper focuses on non-cancer-related chronic oedema. The pathophysiology underlying the development of chronic oedema may be complex and a number of factors may predispose an individual to develop swelling. The charactistics, extent and problems associated with chronic oedema are discussed along with the various management stategies, which can be tailored to an individual patient's needs. The term lymphoedema is commonly used to refer to tissue swelling associated with primary lymphatic insufficiency or secondary damage to the lymphatic system (e.g. following cancer treatment). In most cases, the cause of oedema will have a lymphatic and venous component , but chronic swelling often develops as a result of venous disease and ulceration, trauma, infection, arterial or orthopaedic surgery. Consequently the phrase chronic oedema more accurately reflects the broader aetiology of this problem. Chronic oedema is defined as swelling of greater than 3 months' duration, which does not resolve on elevation. Physical management of chronic oedema combines skin and preventative care with manual lymphatic drainage (MLD) massage, isotonic exercises and support/compression therapy using hosiery garments and compression bandages. Treatment should aim to reduce swelling, restore a natural limb shape, improve skin and tissue condition and enhance quality of life. The lymphatic system plays an important role in maintaining homeostasis, providing a 'safety valve' mechanism whereby interstitial fluid can be returned to the blood circulation. Around 700 lymph nodes are present in the body, predominantly in areas such as the neck, axilla, inguinal and abdominal areas. They form part of an extensive lymphatic system, incorporating a network of initial lymphatics that cover the skin and most internal organs. These thin-walled vessels collect fluid, proteins and various waste products from the interstitium and return them into the venous circulation via a series of lymphatic pre-collector and collector vessels, lymph nodes and larger lymphatics, such as the right and left lymphatic ducts and thoracic duct. The forces controlling interstitial fluid volume are represented by Starling's principle (Figure 1). The movement of fluid between blood capillaries and interstitial tissues is influenced by filtration and reabsorption forces, and the lymphatic system drains excess fluid from the interstitial area. Lymphatic insufficiency and changes affecting Starling's principle, therefore, have the potential to cause oedema. In primary or secondary lymphoedema, damage or abnormalities in the lymphatic system lead to reduced lymphatic transport. Increased filtration due to cardiac failure, increased venous pressure, and increased capillary permeability due to injury, ulceration or inflammation will also result in excess fluid accumulating in the interstitial tissues. In addition, the compensatory mechanism of the lymphatic system may fail due to local damage, causing swelling. In patients with renal disease or malignant ascites, an abnormal loss of plasma proteins (hypoproteinaemia) can occur and lead to an increased interstitial fluid volume due to the decreased plasma colloid osmotic pressure. Movement of lymph through the lymphatic system depends on a number of factors including the contraction of lymph vessels and changes in intra-thoracic and intra-abdominal pressures related to breathing. Lymphatics have a minimal capacity to contract and rely on the pulsation of adjacent blood vessels and the ability of the muscle pump to stimulate lymph flow. Reduced mobility and limb dependency will therefore further predispose an individual to oedema. Chronic oedema usually presents as tissue swelling most commonly developing in one or more limb(s), but often affecting adjacent areas such as the trunk, breast, head and neck or genitalia. Once fluid starts to accumulate in the tissues, a number of other changes take place. The epidermis becomes stretched, there is a proliferation of fibroblasts and collagen fibres in the local tissues, dilation of local lymphatics and increased production of inflammatory agents. In the early stages the oedema is usually 'pitting' and reduces on elevation. In time, as fluid and waste products accumulate, the tissues become hard, fibrosed, 'non-pitting' and do not respond to elevation. Skin and tissue changes occur and, as the lymphatic system has an important immunological function, an increased risk of bacterial and fungal infection is common (Box 1). 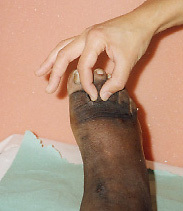 Stemmer's sign (inability to pick up a fold of skin at the base of the second toe, due to thickening of the tissues/fibrosis) is a diagnostic sign for lymphoedema (Figure 2). Primary lymphoedema is associated with an intrinsic underlying abnormality of the lymphatic system, most commonly reduction, obliteration or incompetence of lymphatic vessels and lymph nodes. This may be present from birth (lymphoedema congenita), develop between the ages of 2-35 (lymphoedema praecox) or after 35 years (lymphoedema tarda). Congenital primary lymphoedema is often referred to as Milroy's disease. There are no reliable figures giving the prevalence of primary lymphoedema in the population. However, a UK-based survey carried out by the British Lymphology Society reported that 8% of 603 new referrals to 27 lymphoedema clinics over a three-month period had primary lymphoedema . This is, however, likely to represent the 'tip of the iceberg' as the study also highlighted that 65% of those with primary lymphoedema waited more than five years for referral, suggesting that many go undiagnosed or misdiagnosed for long periods. Secondary lymphoedema, developing as a result of damage or secondary changes to the lymphatic system, may be associated with a range of causes such as cancer treatment, trauma or infection. Most literature to date has focused on cancer-related swelling and information on numbers with non-cancer swelling is limited. Research in the UK has examined prevalence rates of various types of chronic oedema and early findings suggest that significant numbers may be affected, particularly in the elderly population . Secondary oedema resulting from non-cancer-related causes is complex. One study investigated the causes of bilateral leg oedema in a primary care setting in the USA . On clinical examination, prior to investigation, 71% of the 45 patients in this study were diagnosed with venous insufficiency while 18% were diagnosed as having congestive cardiac failure. On further investigation with ECG and Duplex scanning of the legs, the actual diagnoses were found to be cardiac disease (33%), pulmonary hypertension (42%) and venous insufficiency (22%). Other causes of leg swelling include medication, nephrotic syndrome and hypoproteinaemia. The researchers concluded that leg swelling, particularly in those over 45 years old, requires further investigation as the underlying pathology may not be clear on clinical examination. An audit of non-cancer-related lymphoedema  identified oedemas associated with venous disease, trauma, infection, joint disease and orthopaedic surgery. It was noted that extensive, persistent ulceration and recurrent infections led to local lymphatic damage while inflammatory conditions further compromised an already damaged lymphatic system. A further study has reported oedema in 55% of patients with ulcerated legs and concluded that oedema may be a significant factor in ulcers which are slow to heal . Each individual with chronic oedema will experience different problems and the true impact of oedema on any one person cannot be predicted. The majority of research studies have focused on women with breast cancer-related lymphoedema of the upper limb. These indicate that increased psychological distress, anxiety, depression, altered body image, reduced confidence, difficulties with clothes and altered sensations are common ,. Individuals with non-cancer-related swelling appear to experience similar problems and patients with lower limb swelling may have particular difficulties with footwear. Patients with foot and leg swelling are often forced to resort to unsuitable, loose fitting shoes or slippers that compound their reduced mobility and, as a result, may exacerbate a dependency oedema. Skin and tissue changes in leg oedema can be severe and problems such as hyperkeratosis, lymphangioma, papillomatosis and lymphorrhoea (leakage of lymph from the skin)  are unsightly, distressing and further compromise skin integrity. The British Lymphology Society (BLS) has produced a document that outlines four different groups within the chronic oedema population  (Table 1). The purpose of this document is to enable practitioners to determine the types of treatment and care required for different individuals. A 'Framework for Education', determining the educational needs of practitioners managing patients in these different groups, has also been published (see www.thebls.com). Table 1 illustrates the specific criteria for each group and details of the treatment required. It is important to note that individuals may move between groups. For example, excess limb volume may decrease and skin fibrosis or trunk oedema resolve following treatment. This patient would then move from group 3 to group 2, the individual would no longer require specialist treatment and could be managed by a keyworker, often a community-based nurse or physiotherapist. In the UK, specialist lymphoedema care is available from various centres, often based in oncology or palliative care units or through a small number of independent practitioners. The level of access to specialist treatment and care varies enormously throughout the country. Achieving the goal of seamless care and co-ordination of services through the specialist and keyworker network identified by BLS has raised many challenges and various models of care provision are currently being examined. Other European countries, such as Austria, Germany and Belgium have, for several decades, provided specialised treatment for people with chronic oedema through their health systems. A number of specialist centres, such as the F�ldi Clinic in Germany and the Wittlinger therapy centre in Austria, provide inpatient and outpatient treatment and it is common for patients to visit independent therapists for regular, on-going treatment, such as manual lymphatic drainage. A similar picture is seen in countries such as the USA and Australia although, again, access to treatment and care varies and is influenced by financial constraints. A detailed baseline assessment is essential. This should include circumferential measurements of the limb, which are used to calculate the volume of the total limb, proximal and distal limb segments, and excess and percentage excess volumes of an affected limb in relation to the unaffected limb. The calculation of limb volume, based on the formula for the volume of a cylinder, enables the degree of swelling to be quantified and shape distortion identified and provides the practitioner with a method to evaluate the effectiveness of treatment. In a bilateral swelling the volume of each limb may be calculated although, as yet, there is no valid and reliable way of estimating the severity of swelling where both limbs are swollen. Recently, a quality of life tool for upper and lower limb swelling has been developed and validated. This will provide future insights into the experience of chronic oedema and the impact of treatment on quality of life . Many patients, for example those in group 2 (see Table 1), do not require the intensive treatment programme. The success of the maintenance phase depends on the commitment of the patient to actively participate in their treatment. A course of treatment may take 2-4 weeks depending on the severity of the condition. It is not uncommon for treatment to extend over time and be repeated at intervals until the goals have been achieved. The aim of the first phase is to reduce swelling, restore a natural limb shape, improve skin and tissue condition and enhance quality of life. This is commonly achieved through the application of daily treatment consisting of skin care, manual lymphatic drainage (MLD), multi-layer lymphoedema bandaging and isotonic exercises. People with chronic oedema are encouraged to take meticulous care of their skin, washing and moisturising on a daily basis. The main aim is to prevent skin problems that may compromise the protective function of the skin and predispose the individual to infection. Oedematous skin is often dry and scaly; skin sensitivities and dermatitis are common and may result in further damage to local lymphatics. The need for regular use of emollients and lanolin-free creams is emphasised. Patients are also advised on other preventive care strategies such as reducing the risk of skin abrasions, cuts, insect bites and burns in and near the swollen limb. Hair removal using a wet razor should be avoided and individuals should reduce or avoid activities such as sunbathing, hot baths, air travel, venepuncture or acupuncture in the affected limb which may exacerbate the swelling. For some patients lifestyle changes may affect their ability to work and have a significant impact on family life. Acute inflammatory episodes, sometimes referred to as 'cellulitis' are relatively common in people with chronic oedema and should be promptly treated with antibiotics, especially where systemic symptoms are present. The use of phenoxymethyl penicillin (Penicillin V) or co-amoxiclav (Augmentin) is recommended over a 14-day course and may be substituted by erythromycin if the patient is allergic to penicillin . Some patients experience recurrent infection particularly if the acute infection is not adequately treated. A persistent sub-acute or recurrent infection will lead to poor treatment results and a poorly controlled oedema. In this instance, the use of prophylactic antibiotics such as phenoxymethyl penicillin (Penicillin V) is justified and may be required for up to 1 year or beyond. Topical antibiotics are not recommended and patients with persistent infection or skin changes should be referred to a specialist lymphoedema practitioner. The bandage system is usually renewed daily follwing MLD treatment to accommodate the changing shape caused by oedema displacement. Although not all patients will require bandaging, there is evidence that a better outcome is achieved when bandages are used prior to the fitting of hosiery garments . Hosiery garments are a long-term management strategy and for many people with chronic oedema, provide the means to controlling the oedema on a day-to-day basis. Elastic garments intended for venous problems are suitable for some individuals with chronic oedema although most need a full limb garment; many require the flatbed knit garments, which provide greater rigidity. In the UK, many patients are fitted with standard, off-the-shelf garments. However, custom-made garments are increasingly being used following intensive treatment or if the limb is poorly shaped. Any form of support or compression therapy is contraindicated if there is an acute infection or arterial insufficiency or when there is a recent history of thrombosis. Doppler studies are recommended although there are questions over the reliability of results where the limb is grossly oedematous and pulse oximetry may offer a better alternative. MLD is a type of massage, developed in the 1930s by Dr Emil Vodder, a physical therapist. It has been adapted by others who recognised its importance in chronic oedema management ,,. The aim of MLD is to utilise skin lymphatic drainage routes to redirect fluid away from oedematous areas, towards healthy lymphatics. It is a gentle type of massage which uses light pressures and very specific movements to stimulate lymph flow and open up the collateral lymphatics. In the UK it is common for practitioners to teach patients a simplified form of MLD, called simple lymphatic drainage (SLD). This enables patients to continue their care independently and is useful in maintaining the patency of collateral lymphatics following the intensive course of DLT. The main aim of exercise in chronic oedema is to maximise mobility and flexibility to enhance lymph and venous flow. Physiotherapy and occupational therapy referrals may be required. Exercise programmes should be individualised and designed to fit in with the needs and lifestyle of the patient. Walking, swimming and cycling can be useful for those who are fit and movements can be modified for individuals who are frail or have limited mobility. Chronic oedema is a complex condition, providing many challenges for patients and healthcare professionals. Effective control of the swelling and associated problems, however, can be achieved. Practitioners require specific expertise in order to develop, implement and evaluate a treatment plan based on the individual's needs and, where possible, patients should be referred to a lymphoedema practitioner for assessment and appropriate treatment. The British Lymphology Society (BLS) is an organisation that aims to provide information and support for health professionals involved in chronic oedema management. It provides a range of information on chronic oedema assessment and management, publishes a regular newsletter, undertakes an annual conference in the UK and has established a unique support network for practitioners in the UK through the development of regional representatives and various working groups. BLS works closely with the Lymphoedema Support Network, a patient-led organisation, which has developed a supportive and campaigning role within the UK. Along with providing telephone information and co-ordinating the growth of various support groups throughout the UK, they have published fact-sheets on specific aspects of chronic oedema/lymphoedema. They have also recently developed a web-based information Service Directory giving details on all the services providing chronic oedema/lymphoedema treatment and care in the UK. Information on MLD therapists qualified in lymphoedema management within the UK is also available from MLDUK. Lists of therapists and therapy centres in other parts of Europe and countries such as the USA and Australia are also available through a number of websites (see useful contacts). There are a range of lymphoedema awareness days and courses to prepare practitioners to assess and manage patients with mild, uncomplicated oedema. Education and training in specialist skills such as multi-layer lymphoedema bandaging and manual lymphatic drainage has generally been ad hoc, although the number qualified in these techniques has increased significantly in the last five years. A comprehensive educational programme for specialists was run several years ago and recently a modular graduate diploma course has been validated through the University of Glasgow. A number of other exciting educational opportunities are also being developed in the UK to meet the needs of the various practitioners involved in chronic oedema management. 1. Cavezzii A, Michelini S. Phlebolymphoedema. From diagnosis to therapy. Italy: Edizioni PR, 1998. 2. Stanton A. How does tissue swelling occur? The pathophysiology of interstitial fluid formation.. In: Twycross R, Jenns K, Todd J, editors. Lymphoedema. Oxford: Radcliffe Medical Press, 2000. 3. Sitzia J, Woods M, Hine P, Williams A, Eaton K, Green G. Characteristics of new referrals to twenty-seven lymphoedema treatment units. Eur J Cancer Care (Engl) 1998; 7(4): 255-62. 4. Lymphoedema Framework. Towards a National Framework for Lymphoedema Management 2002. 5. Blankfield RP, Finkelhor RS, Alexander JJ, Flocke SA, Maiocco J, Goodwin M, et al. Etiology and diagnosis of bilateral leg edema in primary care. Am J Med 1998; 105(3): 192-7. 6. Hardy D, Taylor J. An audit of non-cancer related lymphoedema in a hospice setting. Int J Palliative Nurs 1999; 5(4): 18-27. 7. Prasad A, Ali-Khan A, Mortimer PS. Leg ulcers and oedema: a study exploring the prevalence, aetiology and possible significance of oedema in leg ulcers. Phlebology 1990; 5: 181-87. 8. Tobin MB, Lacey HJ, Meyer L, Mortimer PS. The psychological morbidity of breast cancer-related arm swelling. Cancer 1993; 72(11): 3248-52. 9. Woods M. Patients' perceptions of breast-cancer-related lymphoedema. Eur J Cancer Care (Engl) 1993; 2(3): 125-28. 10. Williams AE, Venables J. Skin care in patients with uncomplicated lymphoedema. J Wound Care 1995; 5(5): 223-36. 11. British Lymphology Society. Chronic Oedema Population and Needs UK: BLS, 1999. 12. Williams AE. A health-related quality of life outcome measure for lymphoedema. Presentation to British Lymphology Society Conference. Milton Keynes, UK: BLS, October 2002. 13. F�ldi E, F�ldi M, Weissleder H. Conservative treatment of lymphoedema of the limbs. Angiology 1985; 36(3): 171-80. 14. Todd J. Lymphoedema: a challenge for all healthcare professionals. Int J Palliative Nurs 1998; 4(5): 230-39. 15. Mortimer P. Acute inflammatory episodes.. In: Twycross R, Jenns K, Todd J, editors. Lymphoedema. Oxford: Radcliffe Medical Press, 2000. 16. Badger CM, Peacock JL, Mortimer PS. A randomized, controlled, parallel-group clinical trial comparing multilayer bandaging followed by hosiery versus hosiery alone in the treatment of patients with lymphedema of the limb. Cancer 2000; 88(12): 2832-37. 17. Leduc O, Bourgeois P, Leduc A. Manual lymphatic drainage: scintigraphic demonstrations of its efficacy on colloidal protein reabsorptiopn. In: Partsch H, editor. Progess in Lymphology - IX. Amsterdam: Elsevier, 1998; 551-54. 18. Casley-Smith JR. Modern Treatment for lymphoedema (5th edition). Adelaide, Australia: Terrace Printing, 1997.